All posts related to "psoriatic arthritis"
Interviews from the 2018 #CRArthritis Facebook and Twitter Live event are now available on Facebook and YouTube! Thanks to our fans and followers, Arthritis Broadcast Network’s 2018 #CRArthritis Facebook and Twitter Live event reached over 94,205 people to date! We did it! 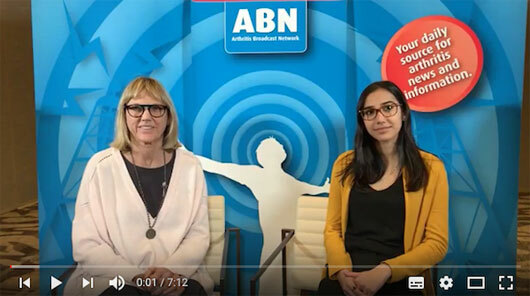 The Arthritis Broadcast Network (ABN) #CRArthritis Facebook and Twitter Live event at the Canadian Rheumatology Association (CRA) Annual Scientific Meeting and Arthritis Health Professions Association (AHPA) Annual Meeting conducted a total of 39 interviews (7 more than last year) in a little over 48 hours. Thank you to all of our interviewers, interviewees, and online audience who participated in the event. Because of you, the #CRArthritis event have informed and educated over 94,205 people to date. We’d say that’s an unqualified success, and you were a central part of making it happen – thank you!